Nothing encapsulates this sentiment better than the Custom Cake Cafe, a dual bakery and bistro located within walking distance of most shops in the small town. From its whimsical sign and outdoor seating to the cozy primitive style inside, this eatery proudly wears its heart on its apron sleeve. 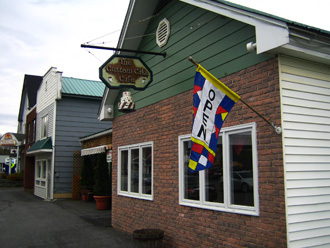 Upon walking through the doors, visitors know they’re in for something scrumptious. The small front dining room is strategically placed just a few feet from a tremendous dessert case and the register. The side dining room is decorated in a warm, country-inspired style. Both feature large windows overlooking the street. But it’s not the decor that has people buzzing about the Custom Cake Cafe. Rather, it’s the delectable dishes that exit from the kitchen tucked away behind the counter. Hunger pangs struck us around lunchtime on a chilly Saturday as we wrapped up morning errands. Ducking into the cafe to avoid the cool winds, we were enchanted by the small yet bold menu. The sandwiches featured fresh ingredients in unique pairings unlike the standard fare at most places in the area. Settling on two paninis and the soup du jour, we sat to wait for our food to arrive. Perhaps because we were the only two patrons in the cafe, our food arrived within minutes. My order, the Matador panini, was piled high with fresh turkey, crisp bacon, melted cheddar, green leaf lettuce and garlic aioli ($6.75). The lightly toasted bread was a pitch-perfect golden brown without being charred from the press. My dining partner was equally pleased with his Pegasus panini, served on a toasted ciabatta roll ($6.75). 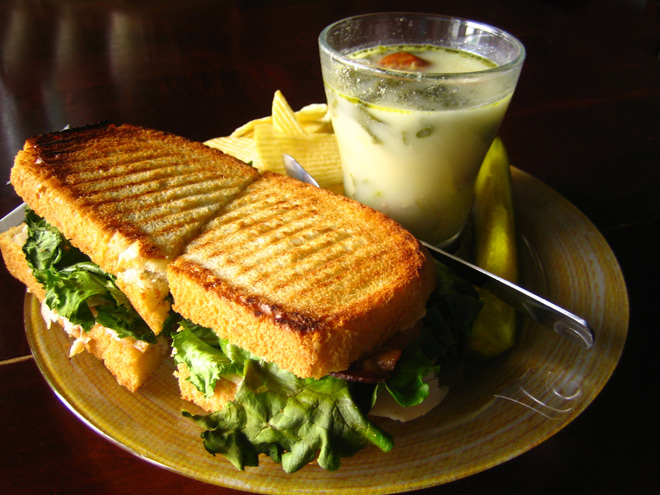 Filled with fresh chicken, spinach and provolone, the sandwich was topped with a delightfully tangy sundried tomato mayonnaise. 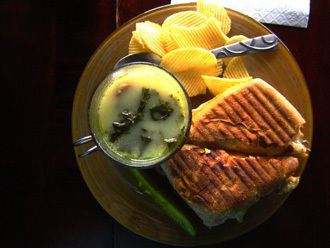 The sandwiches were served with the typical light fare sides: rippled potato chips and garlic-heavy dill pickle spears. Though complementary to the hefty sandwiches, which left us full all afternoon, a slightly more inventive side would have taken the dishes to the next level. Still, sides aside, the entrees were nothing shy of tasty. We both opted for the single soup of the day, zuppa toscana. The creamy broth was filled with slices of subtly spicy sausage, leafy greens and tender potato chunks. Small slices of bacon gave the soup a very subdued smoky taste without overpowering the other flavors. I had only two complaints, both due to my decision to order the cup-sized serving rather than a whole bowl. First, the shape of the glass soup cup was not conducive to scooping out each warm spoonful. It was quite narrow and deep, necessitating a few slurps to savor each drop of the broth. Second, I regretted not ordering a bigger size because the recipe itself was so fantastic. Being quite satisfied with our soup and sandwiches, we almost made the mistake of not ordering dessert on our way out. 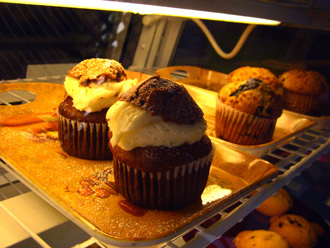 Fortunately, the signature ginger bread muffin stuffed with sweetened cream cheese caught my eye. We had a muffin and a bear claw wrapped up to enjoy later in the day. Sure enough, as evening descended and cravings for a snack hit, we tucked into the desserts. The pastries did not disappoint. The oversized muffin was perfectly moist and had just the right amount of cream cheese filling to balance out the earthy taste of the soft gingerbread. It was spicy and sweet, a perfect finale for a light lunch or standalone treat. The bear claw was equally successful with crunchy pastry dough surrounding a thin layer of almond paste filling. Needless to say, the desserts only lasted a few minutes on our plates before being devoured entirely. The Custom Cake Cafe is a welcome exception to most restaurant fare. From its warm ambience and welcoming staff to its downright delicious food, it left a customized wonderful impression and we’re excited to frequent the venue again.